The Star is one of the three cards – with the Sun and the Moon – among the 22 major arcana that symbolizes a celestial body and refers to the cosmic forces that rule over our destiny. I give you one interpretation of the 17th Arcanum card from the tarot of Marseille. The Star card is a symbol of hope, expectations, harmony, and kindness. It is a guide for your dreams. Any effort undertaken will lead to happiness and success, provided that they are sincere. 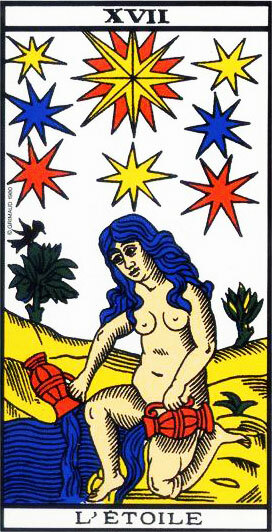 Drawing the tarot card of the Star tells you that if you believe in what you are doing, Lady Luck will smile at you. It will be important for you to keep the faith in what you are doing, and you will succeed. If this card appears in a drawing, you can believe in… your lucky star! With kindness and confidence, you will achieve your own goals. You will be under a positive and protective influence that will watch over you as you fulfill your desires. 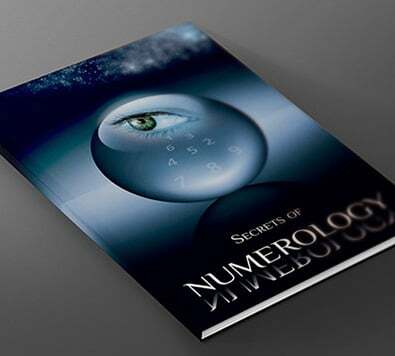 The Arcanum of the Star in indeed one of the most auspicious signs of good fortune. It is an opportunity to express what is best in you, consciously and unconsciously. As you walk that path, you will discover unexpected options and abilities you did not know you had! The Star is the augury of the improvement of your social skills, forecasting an important meeting, either personally or professionally. You stand at the crossroads of your life. If you choose the right path, your existence could be defined anew. You will strive for a greater harmony under the protection of the Star. It enhances communication and trade while smoothing over any difficulty. This Arcanum will protect you against danger and help you to overcome any obstacle. It enhances positive emotions and rekindles the failing flame. It could herald the apparition of love, even if you thought you would never feel it again or if you were lamenting about its tardiness. This card also increases your inspiration, professionally, artistically or culturally. It announces a very rare period of enhanced and exceptional creativity. That tarot trump also foreshadows the end of troubles or hurdles you are currently stuck with and thought inextricable. It symbolizes the return of trust and hope.